The shipping industry has continuously made it clear to the authorities that the Colombo Port’s capacity needs long-term projections fulfilled to give its clients (the shipping lines) the ability to plan the future without uncertainty. Industry professionals know that shipping is a very capital intensive industry and ship owners need to plan their routes and allocate ship space to different ports way ahead as they forecast market growth and to deploy fleets for loop services. Colombo Port’s terminal and berth capacity need to be actioned very fast to avoid long-term disappointment as a nation. History shows whenever the capacity has been increased in Colombo, the port has grown. At the same time whenever decisions were not taken on time Colombo Port has seen many setbacks and lost opportunities. To sustain Colombo’s growth, we need to have a professional approach and to address the issues fast to maintain our transhipment volumes and ports future itself. In my view Colombo still has the operational capacity to handle a further two to three million TEUs provided the utilisation of land space and upgrading of equipment is done by the existing terminal operators who have done an immense amount of work by operating well beyond the design capacities of some terminals as shown in 2018 statistics. All three operators will have the ability to further increase capacity, but it is the Government who which needs to act fast on the East Terminal to sustain growth and ensure Colombo’ growth. As an independent industry professional, I am very disappointed to say the least the way about the manner in which the President and the Government have acted on the port sector as they have given mixed and confusing signals for years to the industry, Port of Colombo operators and global shipping lines by keeping decisions hanging without taking action on much-needed projects and reforms. The Port of Colombo’s growth over the past five years has been based on three key factors, the first one being the reason that the South Harbour’s CICT terminal exclusively offers the needed depth for modern mega container ships with high quality service to the international shipping lines. CICT has been the solution to the mega vessels in South Asia as it is the only viable terminal for such vessel deployment at this moment. Secondly, the growth of India and Bangladesh economies have helped cargo throughput which is our major catchment area for transhipment. Thirdly, the productivity and service level improvement of all our terminals have kept the confidence of international shipping lines to use Colombo as a key location for business and in return helping our National Flag to fly high in the business of transhipment. However, it is time to stop talking and bragging about the growth we have seen over the last five years. Certainly, the credit must go to those who worked hard and took the initiative to develop capacity, infrastructure and productivity improvements of the Port of Colombo. Now we need to work for the future and forecast for the next 10 years as our competition from the region is growing faster than we think. The picture depicts the south harbour and how it should have been as planed in 1999 when the first Public-Private Partnership took place in this country 20 years ago. Indeed, the consortium that operated South Asia Gateway Terminal (SAGT) including SLPA did transform the shipping landscape of Sri Lanka and helped its forward march as a leader in the global shipping map. Whilst there is geopolitical interest in Colombo Port development, the President as the Head of State and the Government must see that the country’s interests are met fast without further delaying what must be done. The solution for the ongoing impasse on the East Terminal may not be difficult for the Government to address, as I see it. I believe national interest, industry interest, political interest and international interest could be resolved if a decision is taken to strengthen the SLPA-SAGT partnership which would be complimentary to each other and industry needs. 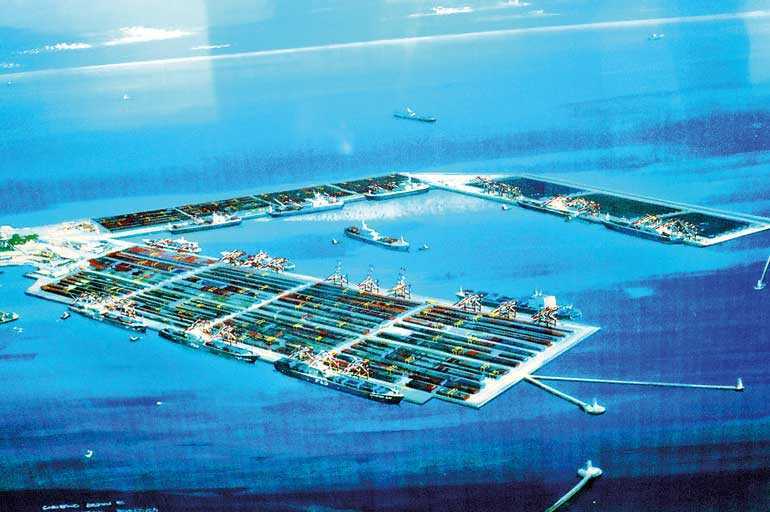 The Government should look at jointly developing the East Terminal (as depicted in the drawing of 1999) with the existing SAGT consortium in a structured arrangement so that global shipping companies are given the signal now on Colombo. The fact remains that the old (east) harbour basin is already shared by both terminals (JCT, SAGT) and the East Terminal provides a solution for both terminals to have access to a deep draught terminal to service global clients whilst CICT has an advantage at this moment compared to the Government terminal and the consortium terminal SAGT. At the same time if any other investors are interested proposals can be called for the West Terminal of the south harbour to simultaneously develop the Port of Colombo. The JCT (SLPA) already enjoys a good revenue stream from the investment made in the SAGT and a future partnership should more than double its revenue with a smart combination. Secondly, it is not a hidden fact that SAGT has a major local conglomerate with a major stake which means jointly SLPA and SAGT consortium will bring in greater benefit to the country in the long run. I am not sure of the current contractual positions of the Government with SAGT, however in the wider interest of the industry and the country, a new partnership should be built where even India and Japan too can be part of a such a consortium to develop the East Terminal and ensure efficient connectivity between the old harbour and the new, which will eliminate a lot of the practical problems. I am certainly not presenting a new plan or reinventing the wheel, just that history of the Public-Private Partnership project had a vision for this development as the design concept of 1999 speaks for itself. Such an arrangement can also remove ideological differences among the President and the Government on developing the East Terminal which will also address the need of the SLPA and the public of this country as well as sustainable development of the Port of Colombo as it celebrates 40 years as an authority in August 2019.